Northants missed the chance to claim a third successive Specsavers County Championship Division Two success as they slipped to a 39-run defeat on the final day at Derbyshire. The home side's young spin attack of Matt Critchley and Hamidullah Qadri carried their team to a thrilling victory at Chesterfield. The 21-year-old Critchley took six for 106 to become the first Derbyshire leg-spinner to claim 10 wickets in an innings for 68 years, while 17-year-old off-spinner Qadri finished with three for 66 as Northants were all out for 274 chasing 314. Alex Wakley made an excellent 68 but his dismissal saw David Ripley's side lose their last six wickets for 47 runs as Critchley and Qadri ran through the lower order. Northants had been slight favourites at the start of the day, but much depended on Wakely, who had scored a century in the first innings, on a pitch that was taking increasing spin. Wakely and Richard Levi played carefully against some accurate bowling through the first 10 overs until Critchley made the first breakthrough when he pinned Levi lbw with a short ball that scuttled through. 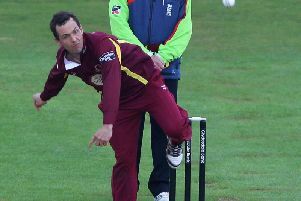 But the odds again appeared to be with Northants as Wakely and Steven Crook added 40 to reduce the target below three figures. However, a game that had fluctuated throughout took another turn when both fell in successive overs. Wakely’s defensive push was defeated by Qadri and in the next over, Critchley got one to spit at Crook, who was caught by Alex Hughes diving at second slip. Seekkuge Prasanna drove Qadri for four and then dispatched Critchley for six over long on but the leg-spinner claimed his fourth victim when Josh Cobb missed an attempted pull. Derbyshire took another big stride towards victory when Prasanna was bowled playing back to Critchley. And when Qadri span one through Brett Hutton’s defence, it was only a matter of when the win was confirmed. Nathan Buck hit Critchley for two fours but when he went for another big shot, a top edge was held by Wayne Madsen running back from first slip to seal Derbyshire’s first win at Queen’s Park since 2008.